Now using our locking speed buckle for quick, non-slip adjustment the Safe Tech Waldo Harness is the world's most comfortable big wall harness. This is also the harness of choice for route setters, and anyone spending long days hanging in a harness. Our patented, adjustable-rise 3-D system creates the best-fitting harness in the world, and ½" (12 mm) thick slabs of foam contour around waist and legs for ultimate comfort. Monstrous components (5-5/8" (143 mm) waist belt and 5" (127 mm) leg loops) spread the load. Super-durable, closed-cell polyethylene foam with fleece lining also contributes to maximum comfort. The Waldo has diamond pattern body fabric and drop seat rear elastics, as well as dual front belay loops to minimize gear clutter. There are six gear loops on the medium and large, and five on the small. 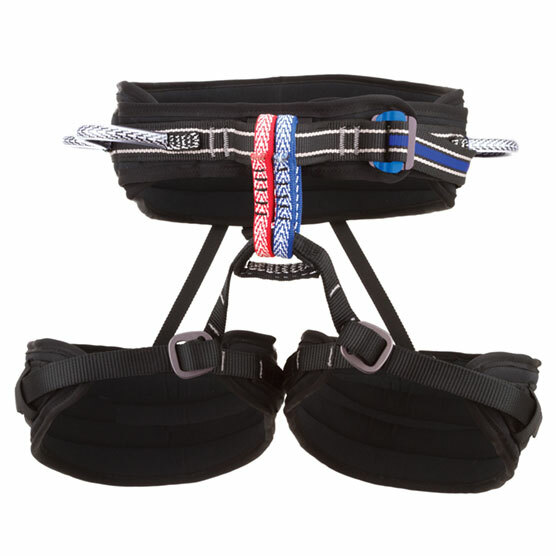 Sizing Note: When fitting the Waldo harness, the buyer should choose a size that will allow him or her to tighten the harness a few more inches from what feels initially comfortable. Wall climbers find that after a few days on a route, with a load of gear clipped to the harness, the ability to further tighten the harness is crucial.